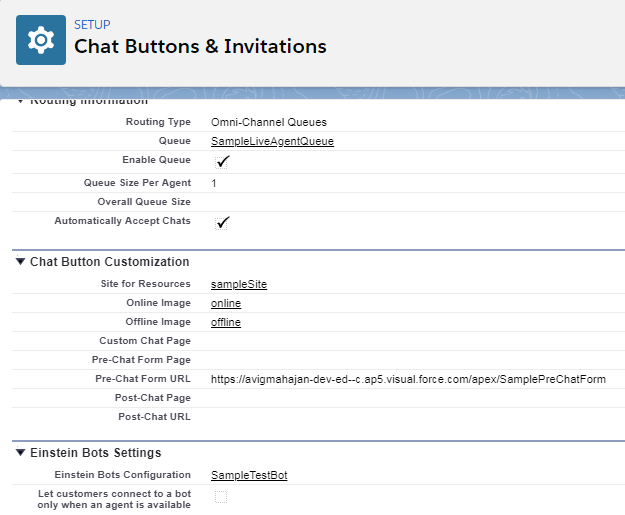 I have a working set up of Live Agent, now i want to add a pre-chat form (visualforce page) based on the sample code. When I fill in the button and push the Submit button, the pre-chat form is refreshing. While it should redirect to the LiveAgent chat. What am I doing wrong? Try the below handlePageLoad function. It is working for me. i was also facing the same issue when i have added my custom vf page in Custom Chat Page lookup. Try to add your VF Page URL in 'Pre-Chat Form URL' parameter in chat buttons & invitations. Also when chat page is opening, Check in Dev Console whether you are getting any console error such as invalid domain. Also make sure your agent is live. Please let me know if this works.